August, I turn the page of the calendar and look over the special days that occur this month. The two days that catch my eye are August 25, Kiss and Make Up Day, and August 27, Global Forgiveness Day. I know in my life I have paid the price of not forgiving, especially myself. This is where somatics really took form for me – when I could feel and sense in my body the energy it took to “not” forgive. In my life there were, and I am sure will continue to be, many times forgiveness was the step I needed to take. Whether it was someone pushing their way past me on a busy street or the candy bar I ate after I committed to a healthy day of eating. Forgiveness isn’t about acquiescing, or making yourself less than the other. Forgiveness is that quality that allows you to soften to the situation and realize that beating yourself up or attacking another individual for their belief system takes up a lot of time and energy that could be used for more useful and fruitful endeavors. Ask yourself this question, What am I holding onto and why? Notice how you release or let go. Did you let go of a story? Did you release a contraction somewhere in your body? Perhaps you let go of a mood around it? Breathe deeply and remember that forgiving simply means letting go. When you experience how you “forgive” or “let go,” you will be able to forgive in other situations in your life. It is a practice for a lifetime. My workshop partner Sandy Sagraves and I are so excited about being with women who are “inspired” to authentically and powerfully contribute to our quickly-changing world. We will be working with aspects of inspired presence as women – cultivating intuition and balance in our lives, and discovering how true power is found in effective action. We will also be having fun in nature – walking the labyrinth, relaxing in the hot tub, and opening our creative side with art. 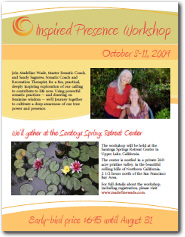 This is a hands-on, experiential workshop that will allow participants to embody inspired action. We will be introducing cutting-edge practices, including a few that may be new to the somatic community. We’d love to include you in this bold, fun exploration!